Acknowledgement for the photo as printed on it. Tactical Strike Reconaissance Aircraft, Mach 1.5, 2000 miles range, low-level penetration with short field take off capability. Built by Vickers of Weybridge and English Electric at Preston. First flight, XR219, 15:28, 27th September 1964 from Boscombe Down, test pilots Roland Beamont and Don Bowen. Flight 14 took off at 13:13, 22nd February 1965 left Boscombe and went supersonic 'dry' before landing at Warton Aerodrome (Preston) for the first time. Flight 16 took the aircraft 200ft above the Pennines. Flight 24 on 31st March was the last. The project was scrapped on 6th April 1965 as a budget cut back by Labour Chancellor Dennis Healey and the jigs and most airframes destroyed immediately. Of the 24 flights Jimmy Dell was pilot on 14 and Brian Moneypenny navigator on a similar number. A large, 100,000lb, bomber with highly swept wings for high speed flight and small wing area for less buffet at low level. Contained advanced avionics to enable low flying underneath radar coverage to give surprise. Bristol Olympus engines newly developed version. Main competitor US General Dynamics F111 Aardvark which was a swing wing aircraft designated a fighter but really a bomber. Another competitor was the Blackburn Buccaneer as elements in the government favoured that aircraft, mainly from their Naval background prejudices or Treasury cost cutting. In 1965 TSR2 was cancelled and an order for F111 placed. However the F111 had escalating costs and technical problems so the UK order was cancelled at great expense. The Phantom was ordered instead and the Jaguar Anglo-French bomber was developed and purchased. The TSR2 was the last UK independent large bomber aircraft ending the heritage of the Lancaster, Canberra, V bombers. The project brought together key elements of the British aircraft industry for a cutting edge requirement that kept us in the league of high capability and technology. 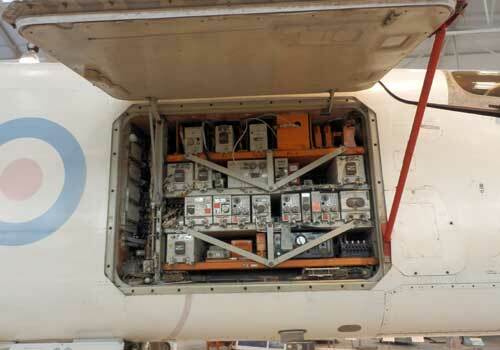 These elements are the airframe, engine and avionics. Not to mention undercarriage and other on-board systems. Forty years later Britain still has this capability but shares it on joint programmes. The TSR2 is certainly, in my opinion an elegant, sleek and mean looking beast. Standing next to it at the RAF Cosford Museum near Telford makes you realise its large size, its narrow fuselage and mean wings. The large avionics bay door on the side of the fuselage housing all that 1960's electronics that is probably not as powerful as a home computer. The massive Olympus engines with reheat. Two of those at reheat with a multiple aircraft take off would have been interesting. The cancellation caused a lot of distrust of government in the area, the two Preston seats being fairly marginal at that time. However in the longer term it doesn't appear to have done the local industry any lasting harm. There are always a lot of politics surrounding large defence projects. TSR2 could have continued in service until around now and so the Jaguar and Tornado may not have been built. The RAF?may have needed an air superiority aircraft; would this have been the F15 or F18 or would a UK / European solution have been created from perhaps a French aircraft. 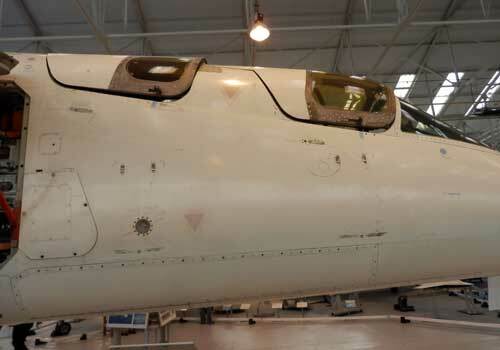 Cosford and Duxford museums have the last TSR2s. 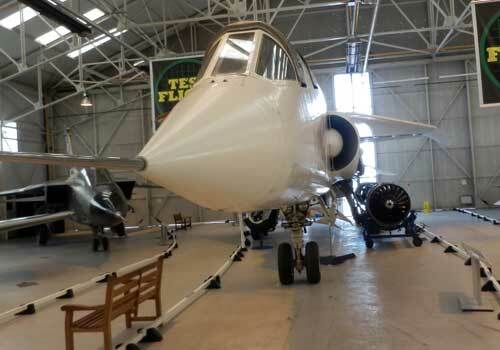 Photograph below of the TSR2 at Cosford. The avionics on the TSR2 were awesome, for the time. The Times of 3rd April 2008 contains an obituary for Wing Commander Jimmy Dell who died on 25th March 2008 aged 83. Born in Liverpool in 1924 he joined the RAF in 1942 and did basic flying training in Zimbabwe and then became a flying instructor. After the war he tested many early jet types and evaluated US and French supersonic aircraft. In 1957 he became Fighter Command liaison officer at English Electric on the Lightning. In 1959 he retired form the RAF?and was appointed English Electrics deputy chief test pilot during TSR2 trials. After Roland Beamont retired in 1965 he became Chief Test Pilot and worked on the Saudi Arabian Lightning and Anglo-French Jaguar. He finally became Director of Flight Operations during the Tornado era and retired in 1989. In 2005 he took part in the unveiling of a TSR2 prototype at Duxford. PC Simulation for MS Simulator. 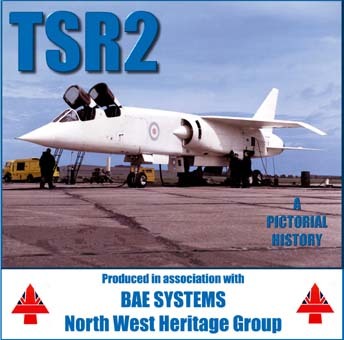 I was going to make a list of books about TSR2 but the link above does a fine job already. There is also some more in the book below, although it is a more general book. The United States, 1945-55: The German Legacy. Soviet Union: The Race for Parity, 1945-55. France: A Phoenix from the Ashes, 1945-55. Great Britain, 1955-60: The Lost Opportunities. Variable Geometry: The uphill Path. Military V/STOL Projects since 1945. Combat Flying Boats: The Last Cause. Military Aircraft Prototypes not mentioned in Main Text.